The medieval garden is a wonderful subject for discussion. Contemporary medieval accounts about cultivation of food provide us with an outline of what a medieval garden was like. Its style, evolution and importance. Accordingly, people today have been able to refer to these historical accounts and create 21st century, medieval style gardens. 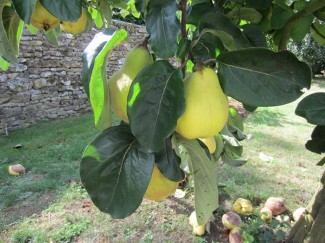 There are some stunning ones, particularly in France and England. I have visited several of these modern-day medieval gardens over the years. Moreover, I have fallen in love with their splendour – as you will gather from this page and all the photographs I have taken! The medieval garden played a hugely important role in the life of people from 11th-15th century Europe. Whether rich or poor. noble or peasant, the cultivation of food was extremely important to all of them. Herbs, vegetables, fruit, flowers and cereals were the essence of the medieval diet. So their proper cultivation meant that people could enjoy a reliable and varied source of nutrition. 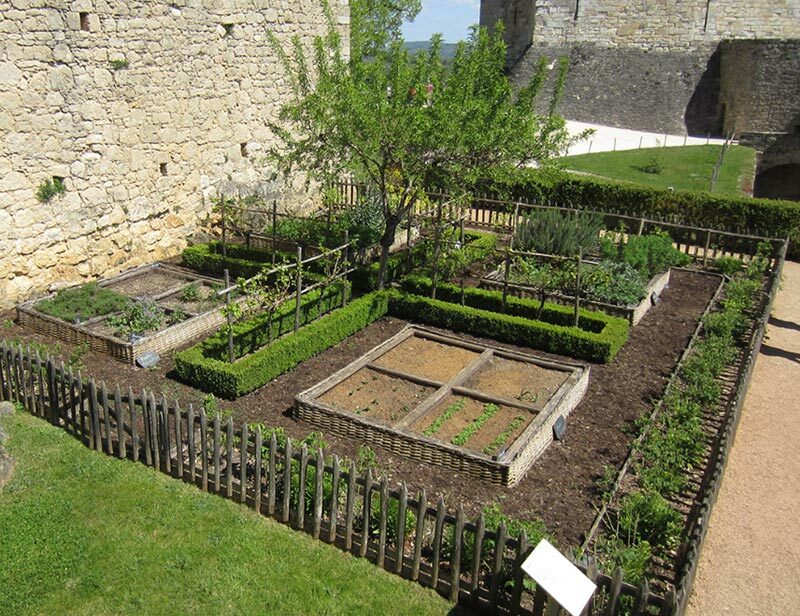 The medieval garden was where vegetables, herbs, fruit and flowers were grown. Cereals such as barley, rye and wheat were farmed in larger, open spaces. Cultivation of a medieval garden demanded a large amount of time and energy. Planting, growing, tending and harvesting were all labour intensive tasks. Each season of the year presented a different challenge in a medieval garden. 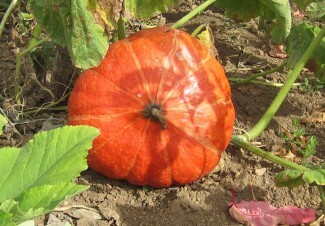 From sowing in spring, cultivation and tending in the summer, picking and harvesting in autumn to preserving in winter. Growing Food: Rich vs Poor – A peasant with perhaps just a little land available to them had to concentrate on growing just vegetables and herbs. This ensured that their family had their daily staple – pottage. In addition, they would enjoy a few hens eggs and barley bread. A noble or rich landowner, of course, had more land and workers available to them. So they had greater options in what, where and how they grew food. Nobles were able to grow everything they needed. This included fields of wheat, much prized in medieval times for the pure white bread it made. They also grew a wide range of flowers which were used to make salads and household decorations. With plenty of land available, they were able to cultivate vast fruit orchards. The fruit they produced had many uses – for dessert recipes, making salads and making fruit wines. Vegetables – from bogbean to broad bean, cabbage to calabash, squash to squirting cucumber! Herbs – all the herbs we know today plus many more since forgotten, eg. artemisia, dittany, hyssop. Flowers – some grown for ornamental use, others for salads and medicinal potions. Fruit – the most common being apples, pears, quince, rhubarb and elderberry. As mentioned earlier, gardening in medieval times was not widely documented at the time. It was thanks to people such as Sir Frank Crisp that we have a better understanding of the subject. Although a lawyer by profession, he was a great gardening enthusiast. In fact, he paid for and developed some special gardens of his own. His greatest historically relevant contribution is his highly detailed, personal study of medieval gardening. Its title? Simply: “Mediaeval Gardens”. Many castles had their own garden and orchard, although most are sadly long gone. However, there are thankfully a few ‘new’ medieval gardens around the world. They have been specially cultivated for people to visit and enjoy. One such garden, and in my view amongst the best in Europe, is in the small medieval village of Bazoges-en-Pareds in The Vendée. I have visited the garden many times. I never tire of its beauty and the wonderful aroma that hangs in the balmy summer air! 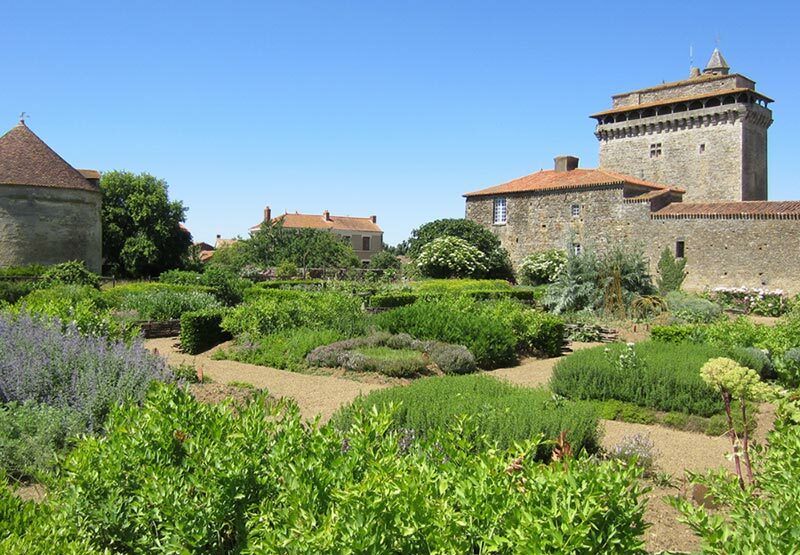 The location of the garden is very special because it is directly adjacent to a medieval donjon (castle keep). The castle donjon has been well preserved and visitors are allowed inside. You can walk up the many, old stone steps to the very top. The magnificent view that greets you is unique. Look down onto the garden below and then raise your eyes to the surrounding French countryside. A simply glorious, historic place! 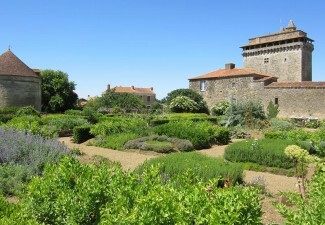 The designers of the garden at Bazoges chose a traditional medieval layout. They split the garden into different sections. Each section houses a specific type of plant. For example, it might be food for the table or plants for medicinal purposes. What makes the Bazoges medieval garden special? It is the quality of the plants and the care that the gardeners bestow on them. Everything seems to have an immaculate precision. What’s more, it is all cultivated with expert loving care. 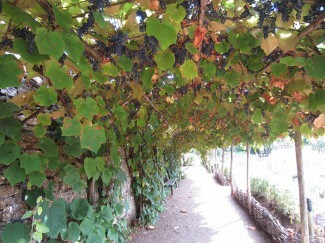 My favourite place in the garden is a wonderful grapevine canopy which provides a shady place to sit. There is an old, trickling water fountain nearby. Not far away is an old, stone, medieval well. 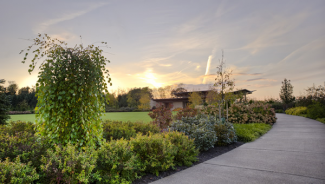 You can sit, relax and survey all the marvellous herbs, vegetables, flowers and fruit trees. It is a quiet place but not silent. During the summer, the sound of hundreds of bees, butterflies and insects echoes around the garden. Take a peek at my gallery of photographs which I have taken over the years in this wonderful French medieval garden. You will see what I mean. If France is not an option for you to visit then there are notable gardens in England and the United States. There are a number of English gardens with medieval plants and features. The gardens are spread throughout the country. Located as far apart as Devon and Cornwall across to Sussex and Kent and up to Yorkshire. The National Trust offers information on several of these gardens here. In the United States there is The Penn State Medieval Garden. The Department of Plant Science at The Pennsylvania State University developed it back in 1998. The idea was to grow and document plants in order to develop informative data sheets. In 2009 the curators rebuilt the exhibit next to the Penn State Arboretum. There is now a Kitchen Garden, Contemplation Garden and an orchard plants grown in medieval Europe. All credit to the people who have taken on such such imaginative and unusual projects. I would love to see more like this!